When my neighbor first decided that she needed a website to promote her freelance monogramming business, she turned to WordPress — not because she knew anything about the software, but because when she brought up the idea of building her own site, WordPress was the #1 name brought up by her girlfriends. It’s true, WordPress’s reputation online precedes itself, but the rave reviews are not without just cause. Here we cover WordPress inside and out — evaluating features, hosts, most popular themes, and more. How Do We Rate WordPress Itself? It’s no secret that we are huge WordPress fans at HostingAdvice.com, but below we go into the nitty gritty details of what makes WordPress great and when there are alternatives to consider. We break down our overall review by categories, covering ease of use, support, cost, and more. The WordPress platform is incredibly powerful and will allow you to manipulate any aspect of your site — however, its functionality comes with a learning curve. This is probably the leading complaint against the increasingly popular platform. If you’re not ready to put in the time to get familiar with the nuances and figure out your way around the backend, I would suggest opting for a WYWIWYG (What You See Is What You Get) web builder, like Wix, instead. Customization is an area where WordPress truly shines. Experienced developers love how flexible it is, and even less-seasoned website managers can easily build a custom site with the help of templates. There are literally millions of these premade websites for WordPress available to give you a head start on design. 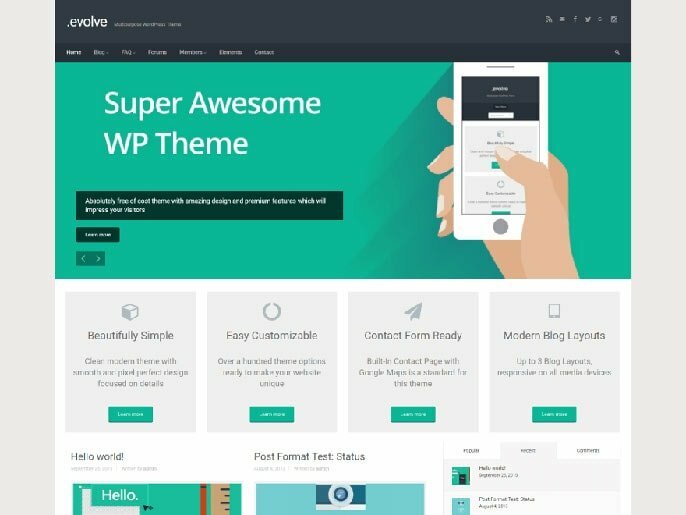 Whether you’re building from scratch or using one of the popular themes, designing and customizing a site with WordPress can yield some of the most beautiful and professional-looking results on the Internet. WordPress support is exhaustive — and exhausting. There is a huge community behind the platform and its followers are eager to offer their advice and expertise, which means the hard part is sifting through the wealth of offered information for useful information. The other option is to hire a WordPress-savvy developer to build your site for you, or consult him/her when needed. Unfortunately, expertise can get expensive. While eCommerce functions are possible with WordPress, that’s not what it’s made for — though there are a multitude of merchant plugins and tools available for adding eCommerce features (e.g., Shopify, Woocommerce, or Ecwid). Platforms like Magento or PrestaShop are specifically made for eCommerce — and you can check out the top Magento hosting services here. There’s a reason WordPress is typically the first platform that comes to mind when you think of blogging. It’s set up perfectly for bloggers — in my opinion, blogging is the easiest task to get started on with WordPress. Within minutes of signing up with a WordPress host, you can blast your first blog post, create new categories and tags, and later share your most popular posts with a hand-dandy plugin. Ahh, the crème de la crème of reasons to choose WordPress: it’s open-source — AKA, FREE! Yes, the world’s most popular website building companion is available for download, install, and web-building usage for zero cost. You just have to pay for the hosting, which, fortunately, should only cost you a few bucks a month (if you use one of the best hosts, coming up next!). If you’re going to use WordPress, you’ll need web hosting. This just means you need a company to host your site — you’re essentially renting out space on the Internet so that visitors from around the world can find your business, blog, or online store 24/7. For more on this, we take you through the basics of web hosting in our beginner’s guide. 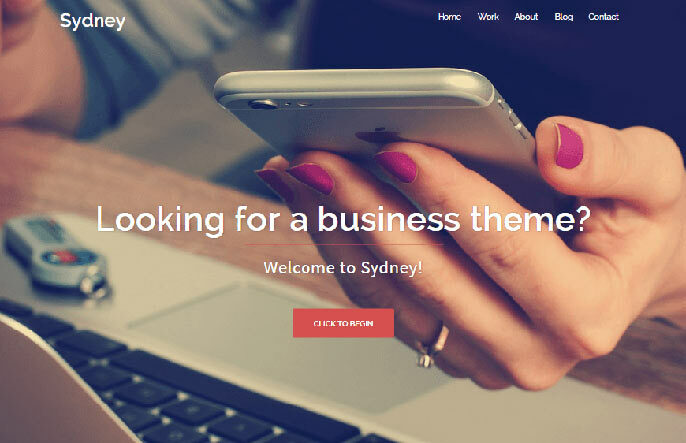 Themes are essentially a premade website template that gives seasoned developers and inexperienced site owners alike an awesome jumpstart on building the beautiful site they want. 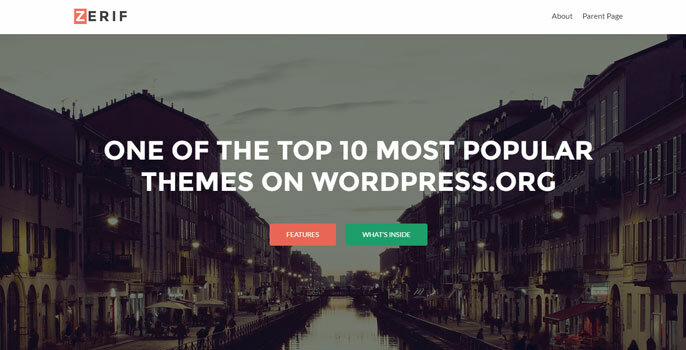 Below we feature the most popular themes for WordPress and why we love them. A visually appealing theme that combines elements common to photography websites and blogs, Adroit is a fantastic theme to showcase strong imagery without losing content. The column-based layout is fully adjustable, and Adroit responsively transitions across virtually any screen size. 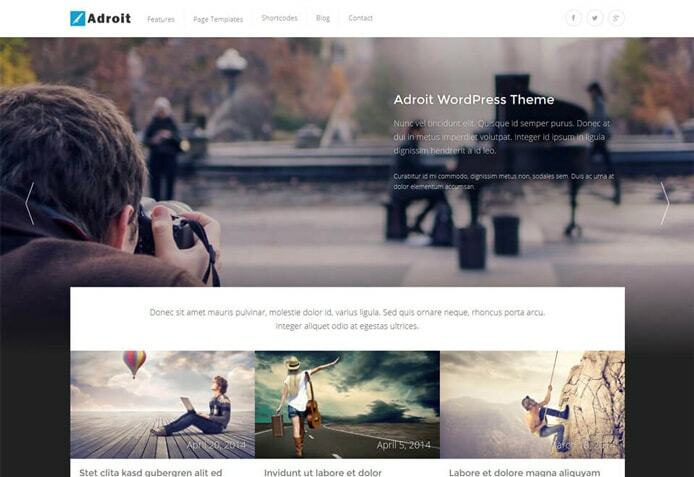 Developed by CPOThemes, Adroit blends photography and blogging layouts to give users the best of both worlds. Sydney is an increasingly popular theme among professionals in particular. Complete with an array of customization tools, this leading WordPress theme is responsive and mobile-friendly, bold and custom-brandable, and easily manipulated to meet a variety of design goals. Sydney includes access to Google fonts, logo uploading, full-screen sliders, and many more customization capabilities. 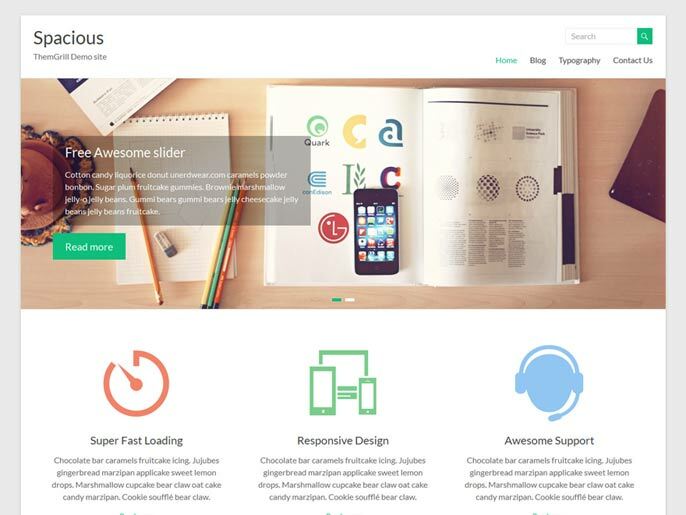 This single-page parallax theme allows you to showcase your personality in a fluid display. Zerif Lite includes options to display testimonials, team members, news updates, and contact information, with a customization experience that’s as intuitive as the resulting user experience. 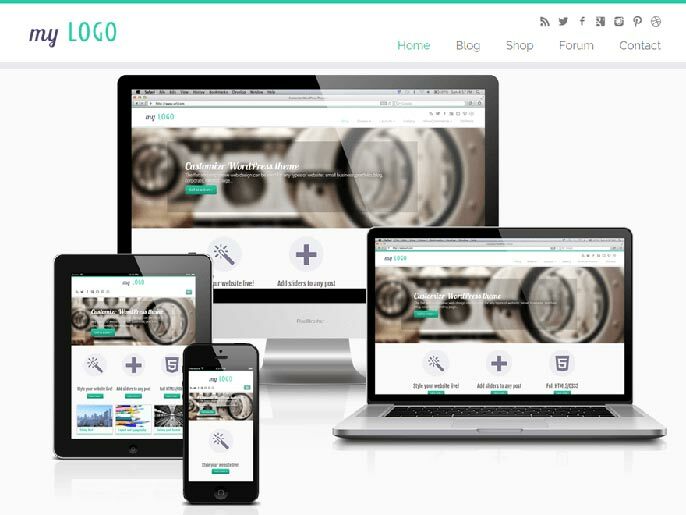 One of the year’s most popular themes for WordPress, Zerif Life features fluid, 1-page design options. As the name suggests, Spacious is perfect for those who want a clean, modern look for their site. It’s a fully-responsive theme complete with options for layout, blogging, color palettes, and widgets. With theme-specific support included, customization doesn’t get much easier. For a clean, modern look, try Spacious — featuring custom widgets and responsive design. Featuring sliders, custom widgets, Font Awesome icons, and compatibility with your favorite social media platforms, Evolve is a fully-responsive futuristic theme with a look that lives up to its name. Modify virtually anything about the design and have a custom-made site live in minutes. Evolve includes an extensive list of customization options, including navigation, slider, social, and widget elements. If a flexible customization experience is what you’re looking for, Customizr’s name speaks for itself. Beloved by site owners in a variety of niches, Customizr is favored for its compatibility with popular eCommerce plugins and extensive options for matching your site’s look to your brand. Customize the eCommerce site you’re envisioning with Customizr. Plugins are powerful tools for adding more functionality and customization to your WordPress site. With the click of a button, you can add forums, product review capabilities, page caching, comment/contact forms, and more to your site. A word of caution, however, you don’t want to add just any plugin to your web pages. You want to make sure the code you’re adding has been made by a credible source — basically to ensure that it’s going to jibe well with the existing code of your site, theme, and even other plugins. We Love WordPress — Shouldn’t You? It’s no secret that WordPress is renowned in web hosting. Now that you know that the functionality and the features live up to the hype, you’re hopefully ready to begin your relationship with WordPress. Yes, there’s a bit of a learning curve, but if you’re willing to take the time to self-teach upfront, you’re in for a wonderful ride. Browse the best WordPress hosts to get started.